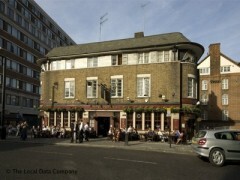 About: The Royal George is a pub situated near Euston Station. It is frequented by office workers during the week and is used as a popular meeting ground for football fans before the games. They serve real ales and traditional pub food. Seating on the pavement is provided, weather permitting. I used to be a regular in here and loved it. There was a fantastic atmosphere and the staff were amazing. However, since the change of people running it I have found it be consistantly going downhill. The last time I went in there the ladies toilets were a total state with missing flooring around the toilet and no way of drying your hands. Also when ordering drinks the staff (including landlord) seem to have no idea what they’re doing. I ordered two vodka cokes and a WKD and was charged £8.03. When I went back to order the same I was charged over £11. When I quetioned this, he (the landlord) said that he hadn’t charged for the WKD the previous time. How two drinks can come to £8.03 I don’t quite know as it would mean that vodka coke was £4 and 1.5 pence each. And even if that was the case, £4 for a vodka is a bit step for a pub such as the George. I for one won’t be returning as I find it sad that a great pub has lost all that we loved about it - including 99% of the regulars.